त्या विकारांचा इतिहास, लक्षणं, कारणं आणि उपचार अशी समग्र माहिती. मनोरुग्णाच्या कुटुंबीयांपर्यंत सर्वांच्याच संग्रही असावे असे पुस्तक! Mental illness has a great deal of stigma and a lack of understanding. 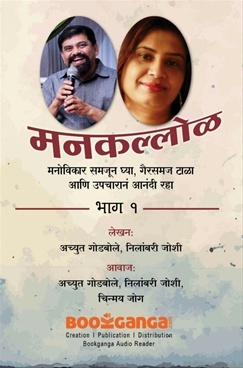 So, in their forthcoming book, Mankallol (part 1 and 2), the author duo, Achyut Godbole / Neelambari Joshi has fairly and accurately described Psychological Disorders in a lucid language. The book covers approximately 70 types of Disorders with variety of test cases, history, symptoms, causes and treatments. Readers can also enjoy the captivating references of literature and movies based on certain disorders. The first part of Mankallol contains Eating Disorders, Sexual Disorders and Addiction disorders etc. Whereas disorders like Depression, Suicide, Alzheimer, Dyslexia, Autism, Stress Disorders, Schizophrenia are included in the second part. The book is a must-read for all the social workers, counselors, family members of patients, school/college faculty members and students.